I recently ordered two necklaces as gifts. However, when they arrived one of the necklaces was broken. Since the breakage appeared to be due to poor quality, I am returning both necklaces. Please email me the return label, as described on your website. We are so sorry you were disappointed by your purchase. We will send you a replacement necklace for the broken one. We are happy to hear that the other necklace met with your satisfaction. I do not want a replacement necklace. The other necklace did not meet with my satisfaction. I would like to return both necklaces for a full refund. Please send me the required return label. We are sorry for the misunderstanding. Can you send me a picture of the damaged necklace? I am attaching a picture of the damaged necklace. Please send me a return label so I may return both the broken necklace and the other necklace which I no longer want. You do not need to return the damaged necklace, so there is no need for a return label. We have issued you a refund for the broken necklace. Thank you for providing the refund on my account. I believe I still need a return label for the undamaged necklace that I no longer want. Please refund my account for BOTH necklaces. This is Geoff, part of the Crackerjack team. I apologize for the misunderstanding. You are correct. You will need to return the undamaged necklace in order to receive a refund for that necklace. There is no return label attached to your email. Will the return label come in a separate email? Sorry about that. Here is the return label. Sorry, but there is no return label attached. Yes, thanks for the return label. However, in today’s mail, I received ANOTHER necklace. I do not wish to replace the broken necklace. I want a full refund for both necklaces. I’m sorry. I don’t know how that happened. Please be assured that we did not charge your account for the replacement necklace. 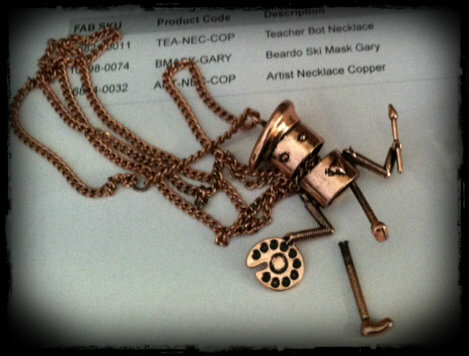 If you have not returned the original necklace, please just include the additional necklace with the same return label. Thank you for all your help. I am returning both the second and third necklaces, but per your instructions, I am not returning the damaged one. Please ensure that I have not been charged for ANY of the three necklaces. Sorry for the all the confusion, as soon as we received the merchandise, your account will be refunded in full. I just opened the mail and surprise! A FOURTH necklace! I am now beginning to wonder whether I have entered the Twilight Zone. Will I be receiving a necklace every day for the rest of my life? OMG! I can only apologize again. This is certainly some kind of glitch in the system. If you have already returned all the other necklaces, please just throw the new one away. To show our appreciation to all our fabulous customers, we are sending you a $20 credit coupon that you may use on any of our wonderful merchandise. So sorry that it is true, but not sorry that you made me chuckle…thanks for that, and to show my appreciation I will be sending you another broken necklace in the mail! Looking forward to another necklace in the mail! Top notch customer service there! And every email promised Satisfaction Guaranteed! Not funny…but too hilarious at the same time. I am going to have nightmares about little orange boxes. Remind me to not have anything to do with that “Crackerjact Team.” BTW, I was starting to get frustrated just reading all the messages going back and forth; can only imagine yours. They seriously called themselves the Crackerjack Team. At first I was thinking you were just making a joke … but reading the responses I see it is TRUE. Wow. I don’t know if laughing about it is evil or not. At least the person you were dealing with seemed polite enough. I love it! Thanks, Geoff, you were incompetent but very polite! It will be interesting to hear if you get any more little orange packages after this post. Sounds like they may have had to much eggnog over the Holidays. But, hey, they are “The Crackerjack Team”. Seriously at first I thought you were telling us they were in a box of Crackerjacks. I think at least one more necklace would be in order. I couldn’t help laughing by the end of this saga! How absolutely ridiculous! I consider myself a fairly good communicator, but obviously I could not seem to make myself understood. I’m laughing, but I want to weep. That’s so sad it’s funny. And vice versa. I was torn between crying and laughing – decided that it would be healthier to laugh – and cathartic to write about it! Ha Ha! I wonder if next week you’ll receive another necklace. Frustrating to say the least, but at least you know one company not to do business with in the future. Oh – but I can’t wait to use my $20 credit and see what comes in the mail! Oh my word! Did you want to scream? What a post! Geoff and I became BFFs. Awesome, and well handled Nancy. I kept telling myself it was amusing – and that I was not being punished by the online gods. I am trying to figure out how many is enough necklaces to start an ebay account. What a good name – the Slackerjack Team! Geoff was quick to respond though – many, many times. I ripped half my hair out by the second response from the Crackerjack Team. Makes me wonder how much these items are worth when they tell you to ‘throw away” an item. Rest assured those necklaces had no value at all. The boxes they sent them in were the most expensive part of the shipments. One of them was certainly useful – to send everything back! Seriously, Nancy, as “silkpurseproductions” implied, what did you expect from a box of Crackerjacks??? My expectations were low, but still in the end too high. oh, I’m so sorry this happened, but I was crying from laughter. I love your poise and key words “thank you for help” MORON AND I HATE YOU. that’s what I am always saying in my head. I used great restraint in refraining from using the word MORON. I did use all caps a few times, which in emails usually means the same thing. Good grief. Customer service just isn’t what it used to be…. Perhaps they’ll make it up to you and try to entice you back with a matching bracelet! LOL. Hilarious! So glad I found this! Laughing semi-hysterically and husband looking on in worry…….